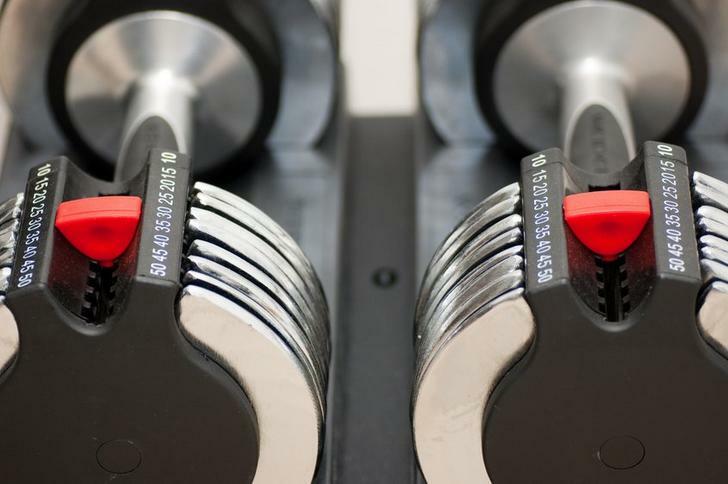 Are you in the market for the best adjustable dumbbells? Well, you’ve come to the right place. This article will help you determine the perfect one for you. More importantly, you will dig deep into every product’s pros and cons to help you weigh out the options and find the ideal one. Bowflex SelectTech 552 remains to be one of the best-selling products in the market. The reason behind is that they’re convenient to use and has a very good quality. While this particular model may not be for advanced bodybuilders, it serves best for beginners and novices. It also offers a lot of comforts while training to prevent injuries. 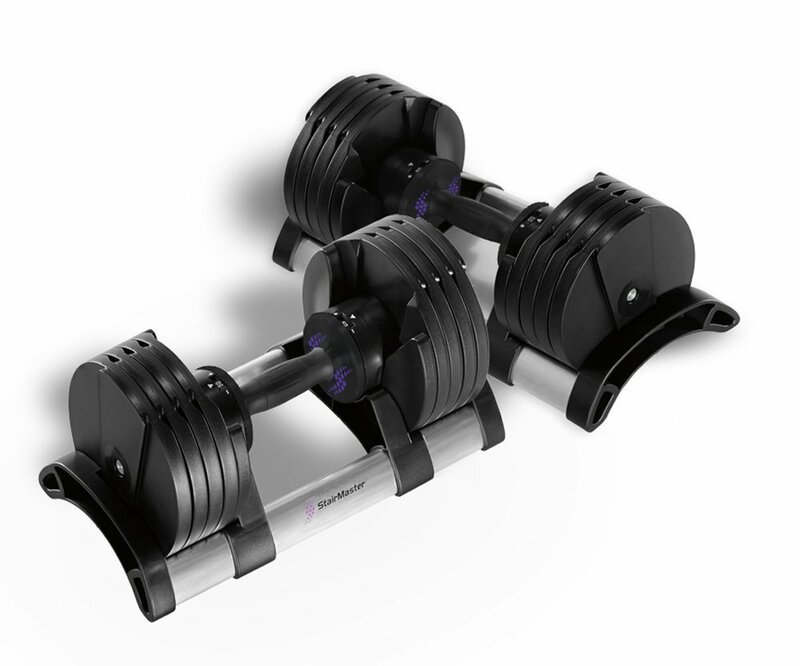 Ironmaster 75 lb Quick-Lock Adjustable Dumbbell System with Stand will meet most of your weight requirements. There’s no question about its durability, efficiency, and quality. Moreover, it serves not only the experienced lifters but beginners as well. PowerBlock Personal Trainer is surely one of the best buys in the market. Although the box design might be unconventional for you, you’ll get accustomed as you go along. Durability is one of the major advantages of this product. Upon seeing it, I’m sure that it will last for years. In addition, its pin adjuster makes it a lot easy to switch from one weight to another. Finally, the 50-pound maximum weight is perfect for beginners and intermediate gym enthusiasts. Generally speaking, Universal PowerPak Adjustable Dumbbells with Stand is a good buy. Replacing 18 weights with a single item less than $300 is very cost effective. Moreover, it is a real space saver. What I love about this product is its ergonomic pedestal. It makes weight adjustment more convenient. Just like the Bowflex 552, its 45-pound max weight is not for advanced weight lifters. MTN Gearsmith Heavy Duty Adjustable Dumbbell embodies the very essence of adjustable dumbbells – convenience and space saving. This piece of equipment is simply stunning and attractive to the eyes. This pair of 50-lb Bayou Fitness Adjustable Dumbbell suits best for the more seasoned bodybuilders. Contrary to the 25-lb pair, this adjustable dumbbell will make your muscles pop fast. It can also target several muscles groups as long as you religiously follow your routine. Personally, it’s one of the robust set I’ve seen, and I can vouch for its durability. There are several things that set the StairMaster apart from its competitors. Aside from its compact design, it also allows flexibility with weights up to 100 pounds. Meaning, this dumbbell set is both for beginners and experts. 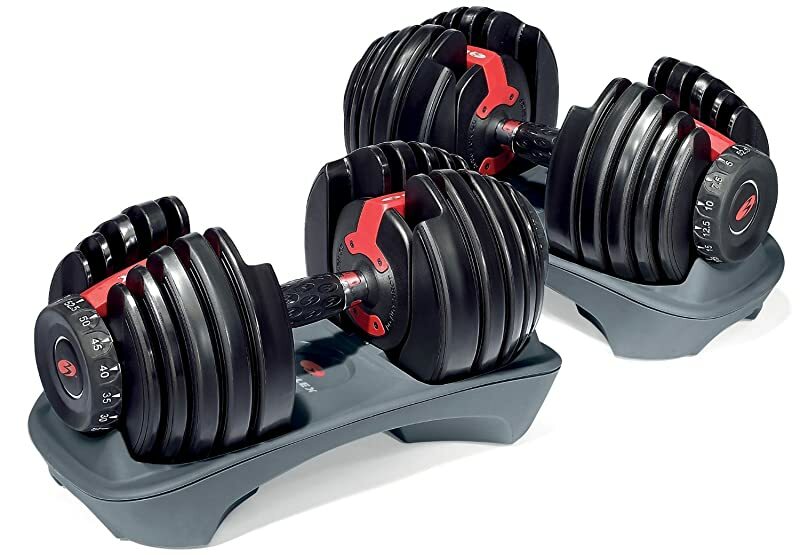 If you want to start building a home gym, you may want to start with Bowflex SelectTech 552 Adjustable Dumbbell. It allows you to do a whole range of strength workout for comprehensive training. This revolutionary equipment is well-designed and ergonomic. It combines 15 different weights into 1 using a unique dial system. Ranging from 5 to 52.5 pounds, switching from one weight to another is a breeze. For added security, you get 2 years warranty for plates and 1-year warranty for labor. Finally, pump up your workout plan with a free Bowflex® SelectTech® workout DVD. Overall, this product is very enticing to those who are just starting. With a price tag less than $300, I’m giving you the green light to buy this product. Check out other revolutionary machine from Bowflex HERE! If you want 18 individual weights in one space-saver equipment, try considering Universal PowerPak Adjustable Dumbbells with Stand. It has a wide range of plates ranging from 4 to 45 pounds. The 5-pound increment allows you to have a dynamic workout routine. Also, durable thermoplastic handles make it more comfortable and safe to use. Lastly, one peculiar feature of this product is its stand. 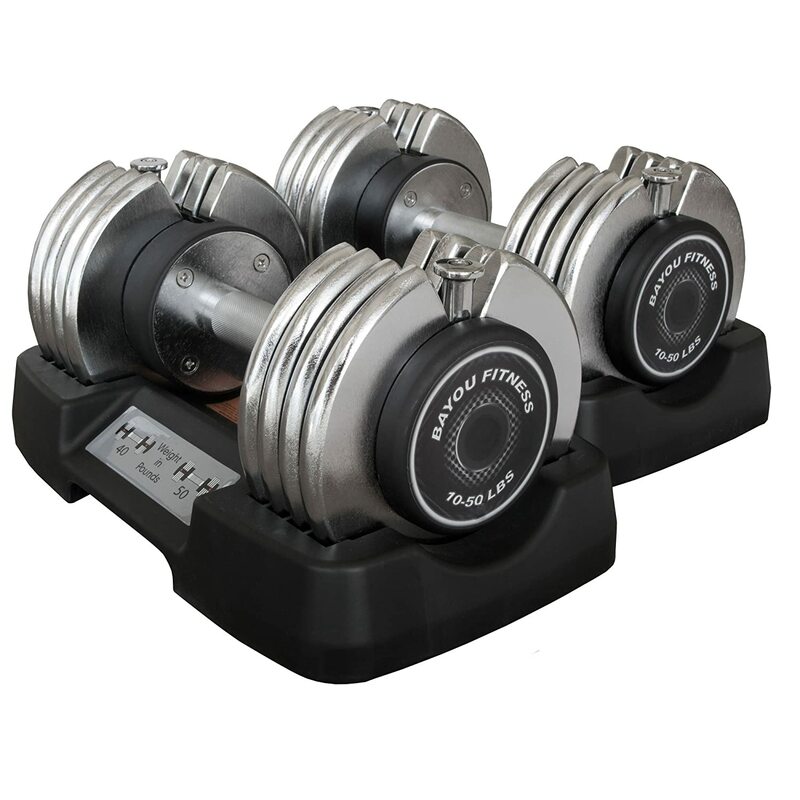 It is ergonomically designed so that you can store your dumbbells orderly. In addition, the absence of rubber padding in the handles is simply uncomfortable. The presence of thermoplastic padding is not enough. Overall, this product made it to my list for several good reasons. Thus, you may include this on your possible prospects. This piece of equipment can be perfect for people looking for versatility and effectivity. This single unit of dumbbell system can expand and meet your strength demands with less effort. PowerBlock Personal Trainer is a stack of weights connected to together. Using a simple selector pin, you can select the appropriate weight for your weightlifting program. From 2.5 to 50 pounds, you can easily follow your progressive muscle toning routine with every 2.5-pound increment. More importantly, your can rely on its quality and its 10-year warranty. 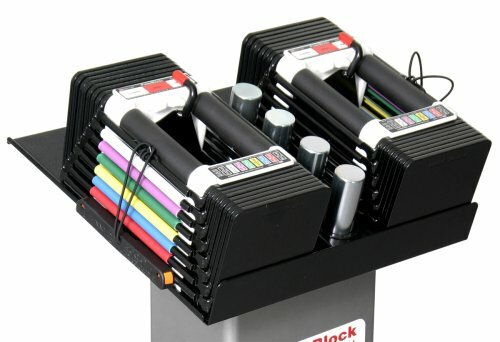 PowerBlock Personal Trainer is surely one of the best buys in the market. Although the box design might be unconventional for you, you’ll get accustomed as you go along. Durability is one of the major advantages of this product. Upon seeing it, I’m sure that it will last for years. In addition, its pin adjuster makes it a lot easy to switch from one weight to another. Finally, the 50-pound maximum weight is perfect for beginners and intermediate gym enthusiasts. However, if you want an expandable version, you may check it on this link: Click Here! If you think 50-lb dumbbells are too light for you, why not try this 100 pounder? Coming from one of the most reputable manufacturer Bayou, this equipment is sleek and versatile. Similar to other brands, this model has a dial that helps weight adjustment fast and convenient. However, contrary to average dumbbells, this heavy duty pair weighs 50 pounds each. Moreover, the 10-pound increment is perfect for experienced gym enthusiasts. Having a small space will not be an issue. Measuring 18 x 13 x 11 inches, it only takes a small space in your home gym. However, some users may complain about the rattling weight and hard to fix adjustable dial. Aside from these minor issues, it’s still a product worthy of space in your home gym. If you’re looking for versatility, this set of dumbbells is perfect for you. You may choose among different weight ranges depending on the intensity of your workout. For example, they have a 52.5-pound option for beginners. Similarly, they have a massive 200-pound for experts. To make lifting safe, the handles and collars are threaded. Plates are also made from durable cast iron. Finally, this piece of equipment is such a beauty. You may choose either a black or chrome coat depending on your taste. There’s no question why MTN Gearsmith Heavy Duty Adjustable Dumbbell can’t be a part of this list. 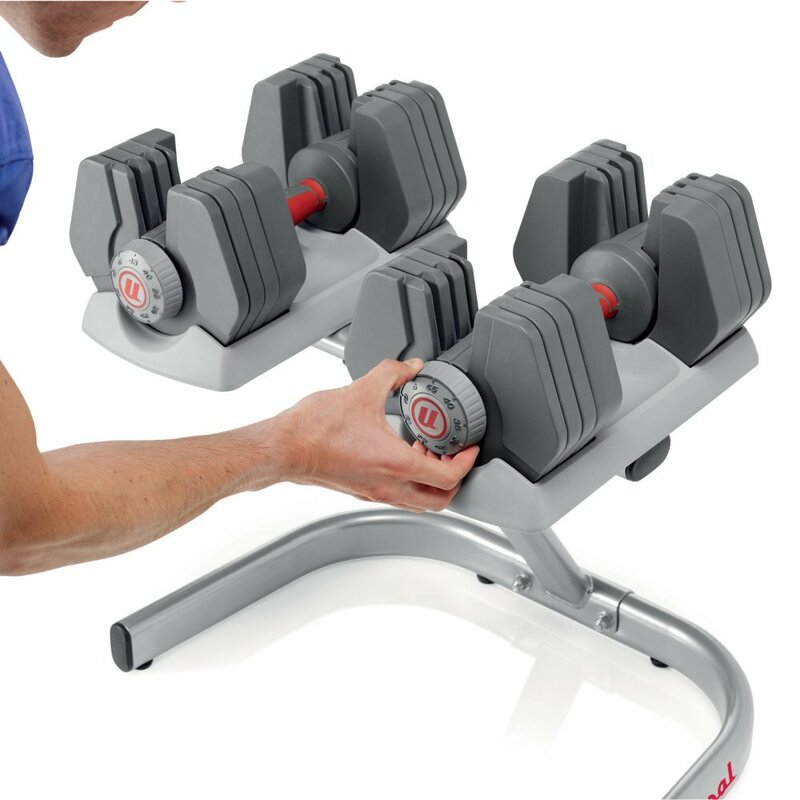 It embodies the very essence of adjustable dumbbells – convenience and space saving. This piece of equipment is simply stunning and attractive to the eyes. However, it goes beyond its looks. It is built to last long. More importantly, you get to choose the weight that suits your training program. Aside from petty issues and lose weight adjustment, I can only hear nice words about this product. Therefore, you may go ahead and give it a try. 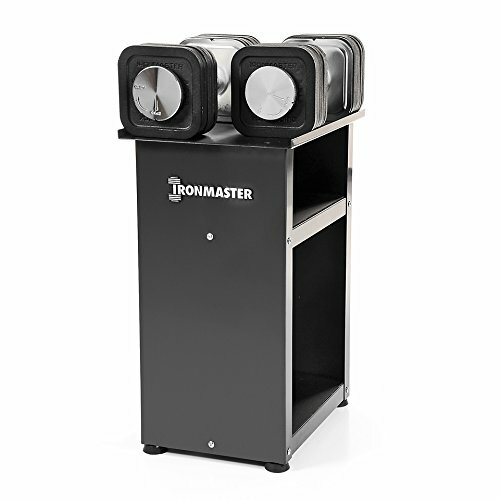 The Ironmaster adjustable dumbbells is a great option for anyone wanting to expand their home gym. Its quick-lock system makes it easy for you to change weights during your workout routine. Made entirely of solid cast iron, there are no plastic parts that can break easily. It has a weight range from 5 to 75 pounds with 2.5-pound increment. It is so space efficient that it only takes less than 2 square foot. More importantly, it is perfect not just for beginners but for experts as well. In addition, it comes with its own stand. Hence, you can free yourself from worrying where to put it. However, just like other brands, it has a few drawbacks. The most notable of all is the locking system. Although it is easy to use, the thread runs out once you add more and more plates. Meaning, when you reach 75 pounds, you have a small thread left to secure the weight. Aside from this, there are no other issues. 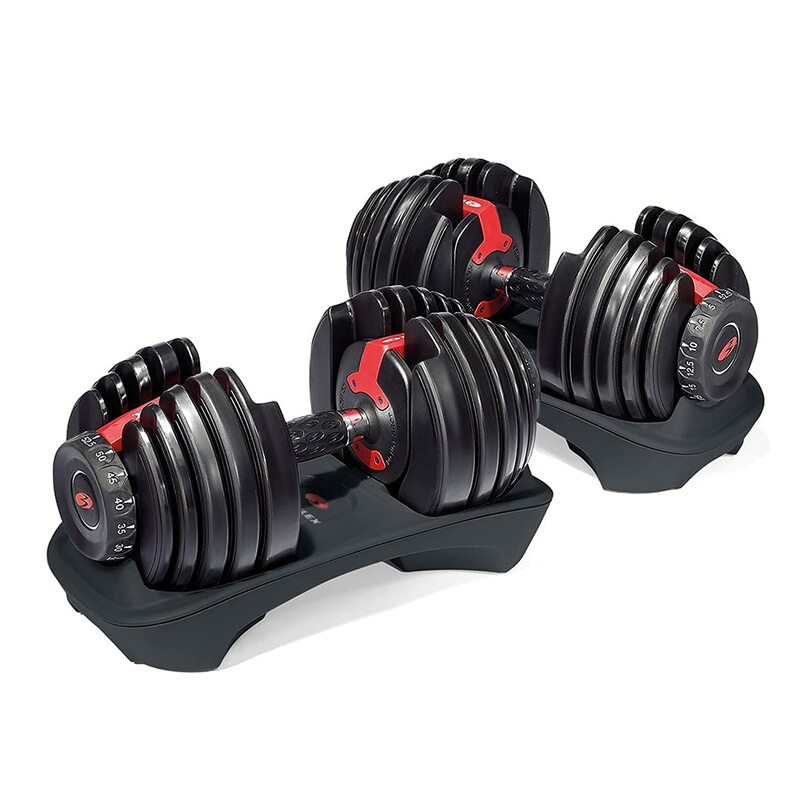 This product has one of the most compact patented among adjustable dumbbells in the market. 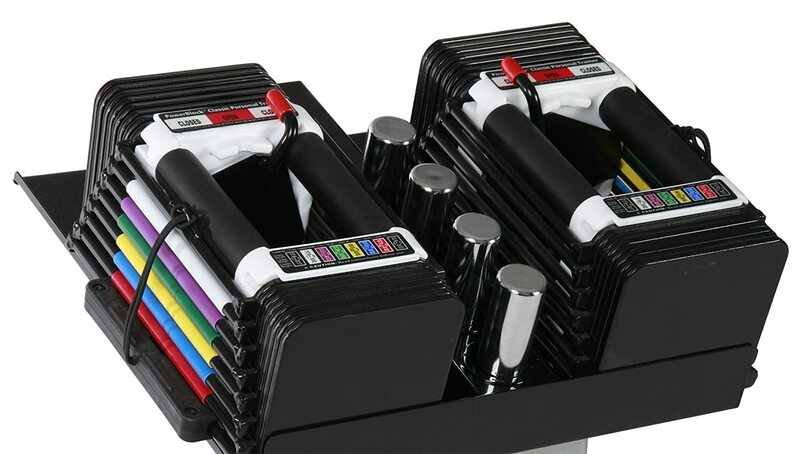 To make your workout more comfortable, the soft grip handles are specially contoured. It comes with an aluminum cradle where you can adjust the weight. It makes using this dumbbell safe since you have to dock it to adjust it. In addition, you can clearly see the weight settings through the weight selection windows. Putting a lot of technology during the designing stage, this dumbbell surely stands out. Lastly, it has a unique twist and locks weight switching model. For optimum weight lifting experience, you may want to shed additional bucks for it ergonomic stand. There are several things that set the StairMaster apart from its competitors. Aside from its compact design, it also allows flexibility with weights up to 100 pounds. Meaning, this dumbbell set is both for beginners and experts. Its unique twist lock system is also a major turn on for fitness maniacs. It allows users to adjust the weight only of it is in its aluminum cradle. Clearly, Stair Master puts the safety of its users first. Its compact and contoured design matches with a good price make it one of the hottest brand among our list. Weight lifting should be a part of your workout routine to keep your body in optimum shape.. However, your training should be dynamic and progressive. Hence, you should not settle in lifting a single weight alone. Time is also a major consideration in working out. For most individuals, going to the gym 4-6 times a week is just a tall order. Thus, they prefer to have their own workout equipment at home. However, it’s impractical for you to allot enough space for dumbbells of all weights. 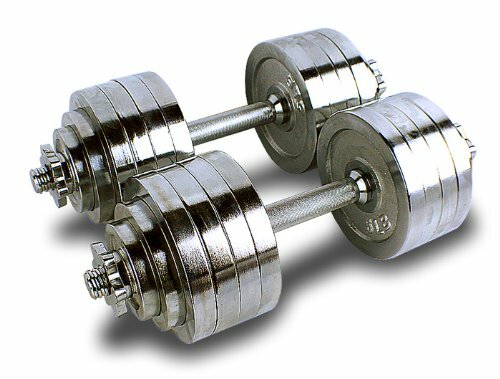 The need for multiple dumbbells in your home gym paved the way for the development of adjustable dumbbells. Using technological advancements, experts develop equipment that holds a variety of weights but occupies less space. These adjustable versions offer makes it easy to select the weight they want to lift. By simply adjusting the dial, you may lift as light or as heavy as you want without buying a whole set of weights. Sounds fun and convenient? The adjustable dumbbell is one of the best home gym equipment that you need to invest in. Here are some of the reasons why buying your own is a clever idea according to Boxing Scene. To achieve your most desired physique, you need to perform a variety of exercises. With adjustable dumbbells, you can target a wide range of muscle groups through different workout routines. Unlike other weight machines, it is not limited to one application only. By simply changing your position, you can perform routines that target your back, lose chest fat, arms, and shoulders. As a fitness enthusiast, you have the option to pay for fitness gym membership or buy your equipment. I recommend choosing the second option. You can purchase an adjustable dumbbell and achieve the same results in a fraction of your membership fee. In addition, you can save time and money by doing your workout routines in the comfort of your home. 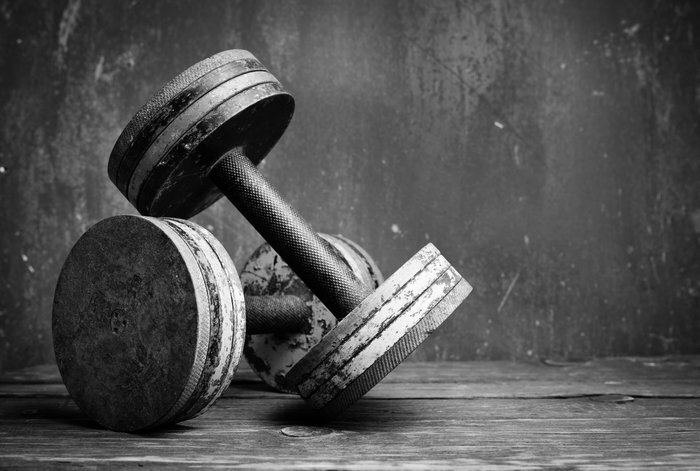 It’s one of the major reasons why more gym enthusiasts prefer it over conventional dumbbells. By simply adjusting the dials of changing a pin, you can instantly change the weight you’re lifting. You don’t need to go back and forth to move from one weight to another. An ordinary set of dumbbells uses a rack for its storage. Depending on the range of weights, it may occupy a huge space in the gym or at home. On the contrary, adjustable dumbbells are totally different. It occupies almost the same space as the largest dumbbell in the group. If you defer putting up a home gym because of lack of space, you now have no excuse. 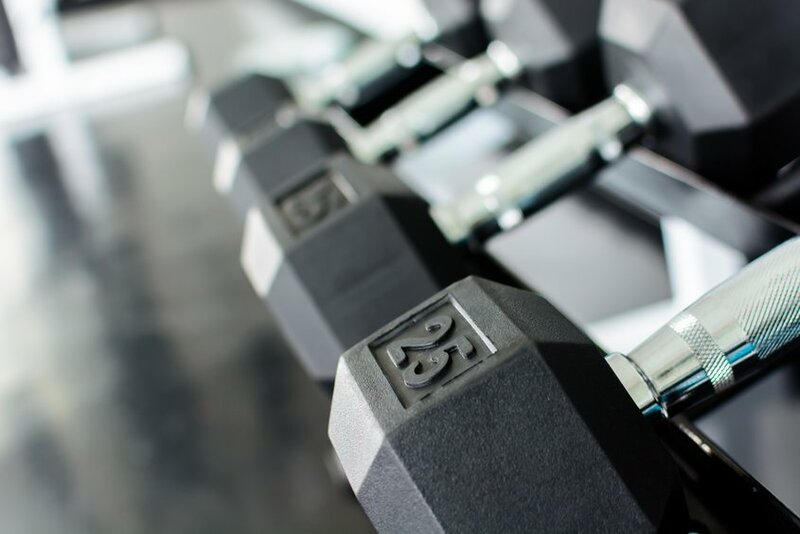 Due to the increasing popularity of adjustable dumbbells, it’s not surprising to see several brands in the market. Similar to buying any equipment, you always want to ensure that you’re getting the best quality the first time. The primary essence of an adjustable dumbbell is the convenience in switching from one weight to another. Therefore, this must be one of the first considerations to consider. Some dumbbells that use dials to change the weight. On the other hand, pins are also a popular option. Any of the two mechanisms is acceptable. What matters most is you don’t spend much time in between sets just to switch from one weight to another. Although adjustable dumbbell is a set of weights by itself, it simply cannot have all the weights you need. Hence, pay attention to the range of weights inclusive in a particular product. See to it that you can get the lightest up to the heaviest weight you need in your workout program. Also, Fitness Blender suggests looking forward in advance. You will not stay at the same weight for a long time since you will outgrow it. Thus, it is much better to look for a product with a wide range of weights. Personally, this is a feature that I wouldn’t compromise. You’re spending a few hundreds of dollars for this piece of equipment. Hence, I assume that you want it to last. How will you know if the quality is good? Simply take some time reading reviews about your prospect. There’s no better way to know about a product aside from those who are using it. No matter what we buy, we always look at the price first. Buying a quality type of adjustable dumbbells doesn’t mean you need to spend more. There are brands that offer a great balance of economy and quality. My personal tip for you is to check and compare prices. Eventually, you will land a great deal without hurting your wallet. Generally, the best choice for any product is a perfect combination of quality, price, and purpose. On top of that, don’t be a compulsive buyer. By learning more about the item you want to purchase, your satisfaction is almost guaranteed. Flexibility – This set has a pair of 52.5 lbs dumbbell with 2.5-pound increment. This range of weight is perfect for all types of fitness enthusiast. Some brands offer a 5 to 10 lbs increment which I believe is too huge for starters. Convenience – Bowflex uses a simple dial that lets you adjust or switch the weight easily. With a few twists, you can perform a dynamic workout routine with weights that are securely fastened in its padded handle. 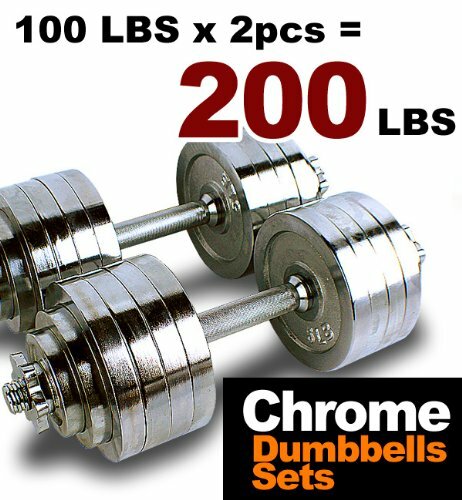 Cost effectiveness – Similar adjustable dumbbells may cost you more than $300. However, this one of a kind product is less than $250. Also, it comes with a two-year warranty that covers the plates and labor. Can anything be more affordable? Space Saver – Measuring 15.75 inches long, 8 inches wide and 9 inches tall, this pair of dumbbells is truly a space saver. It easily replaces 15 sets of weights that could have occupied a lot of space in your home gym. Additionally, it comes with its own cradle to prevent from rolling around. Quality – This machine will definitely last long. It uses durable rubber pads to wrap the plates and handle. Thus, no matter how hard you drop them on the floor, it will never break or fall apart. More importantly, Bowflex uses state of the art technology in building this adjustable dumbbell to ensure that quality doesn’t get compromised. If you want budget and space-friendly equipment that is suitable for home use, do not forget to check out our latest reviews of best treadmill under $1000, best treadmill under $500 and best treadmill under $300.